Four go wild in the mountains. Getting out and about with our dog Meg had become a little difficult over the last couple of years, she is now 13 and her legs don’t work as well as they used to. Since we now have an addition to the doggy family in the form of the happy wanderer, 4 year old Lola, we were keen that she wasn’t left out. Stopover hotels were booked, always with a bit of a theme in the summer months. We had Champagne in Epernay for our first night, a beautiful house on the Avenue de Champagne. Only the steep stairs proved too much for Meg and she needed carrying up and down, although she enjoyed her walk to dinner in the town. On arrival, we were shown to a beautiful terrace with a garden below where the dogs were free to roam while we enjoyed a glass of their house Champagne. After a good night’s sleep, a leisurely and delicious breakfast followed a walk up the Avenue de Champagne and a romp in the park behind Mercier for Lola. She is loving the holidays so far, although sharing the car seat with Meg, instead of being in the boot is a new experience. Next a short drive south to the wine region of Burgundy. We take our usual break for lunch in Nuit-St-Georges then head to our stopover hotel, Maison Olivier Leflaive in Puligny-Montrachet. The weather was beautiful,and the wine fabulous. A four course dinner accompanied the wine tasting. So peaceful here, with only the church bell interrupting the silence. We took an afternoon stroll around the vineyards with both hounds; Meg seeming to come to life the further we got from home. I swear she could smell the mountain air. Another delicious breakfast, and we were on our way south to the mountains, to our favourite place in Le Monetier-les-Bains. We ski here in winter and walk here in summer. 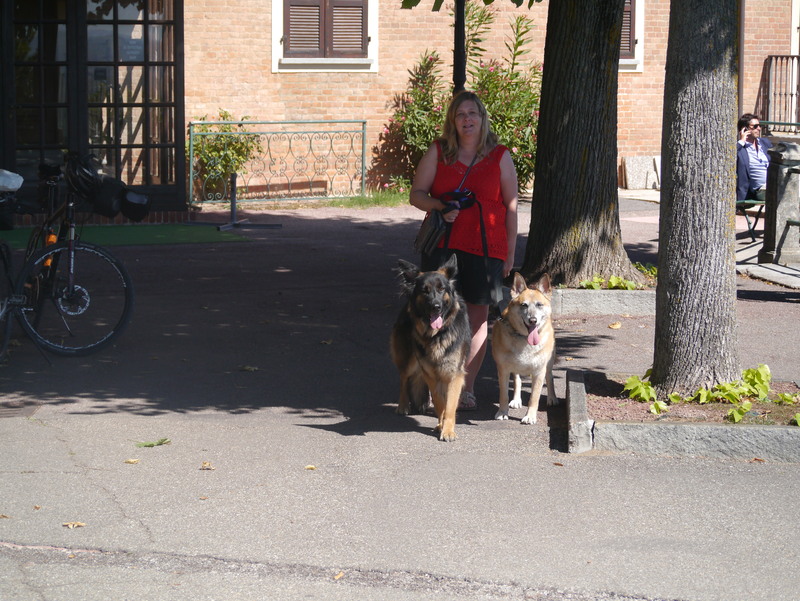 Lola is keen and eager to go out this morning, but Meg is a little more reluctant and takes some persuasion to get to the lake at Le Casset. 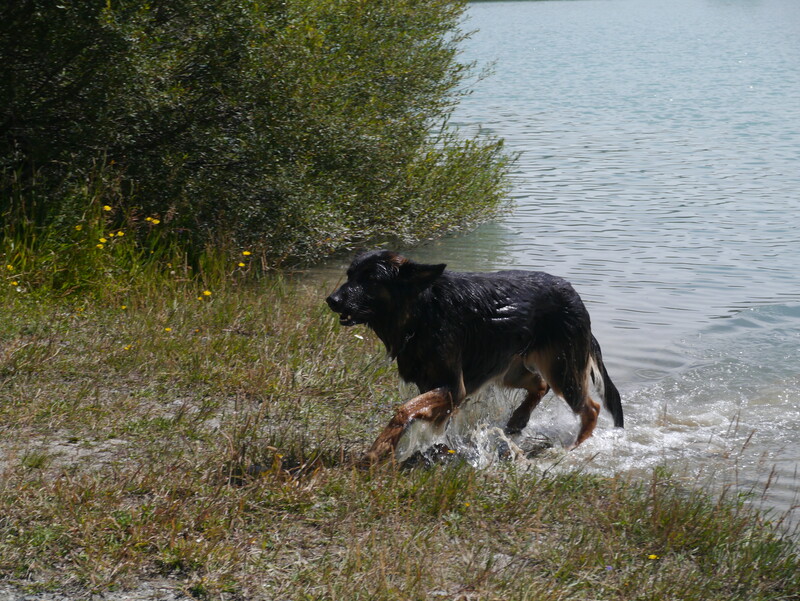 A few minutes later, both dogs are wet and hubby is wading in to find a lost ball. The lost ball theme continued for the rest of the holiday, being abandoned in rivers, lakes and the village streets, before being reunited with Lola. We relaxed, cycled and ate well. That is what holidays are for. Eau de Petit Pont in Villeneuve had to be the favourite of this trip at least with the mountain ‘salad’ at Chez Finette running a close second. After an initial cool spell, and a day of rain, the weather was beautiful, and it was almost a shame to go south to Barolo for a couple of nights. I say almost. A friendly agriturismo, Il Gia d’Oca, just outside the village, with friendly owners, wine tasting on the doorstep and amazing food and wine were only exceeded by the unbelievable views from every hillside, with the Alps towering on the far horizon. We ate and drank like kings, Il Cantinetta in Barolo serving us a beautiful raviolo with a duck egg inside it. Beautiful wild boar ragu, wonderful plates of antipasti, and the desserts were to die for. Local agnolotti al plin and risotto funghi were also available. We headed back to Monetier in glorious hot sunshine via Ikea to collect some essential items for Chamoissiere. More relaxation and eating were accompanied by some of our purchases from Barolo, but mainly we stuck to the local Haute-Alpes wines which are very good, and only found in the area. 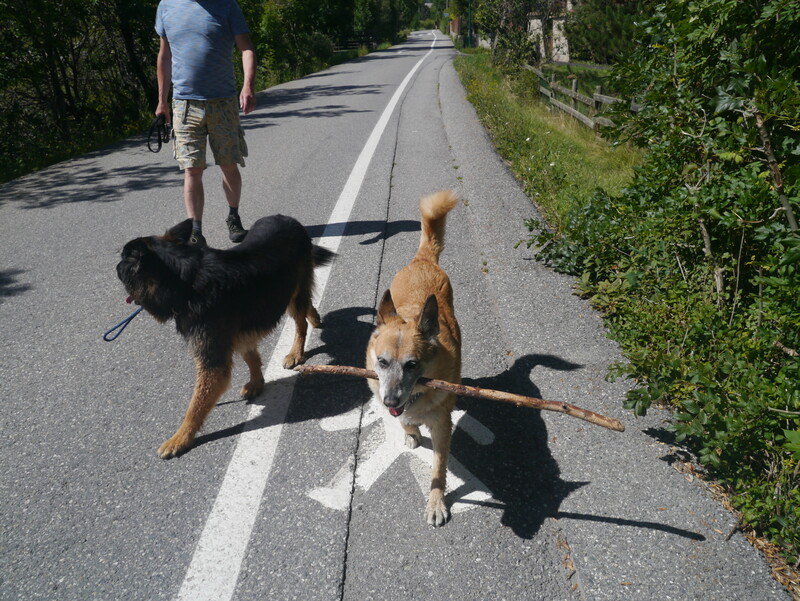 There were more walks for Meg and Lola, trips to the village, and splashing in the streams and lakes. We mended things, cycled a little and enjoyed the warm pleasant sunshine on the terrace, although the autumn chill was starting to appear in the mornings. Finally, we headed home, stopping overnight at Auberge de Moissons, near Chalons-en-Champagne. One of our most visited hotels en route, as it is so close to the autoroute, but very rural and a great place to walk the dogs. Meg was extremely eager to get out for her evening walk, and would not let us leave without her. We stocked up the car with more wine in Calais, then our final lunch in France at Au Calice, before our Eurotunnel crossing and our journey home. Such a wonderful trip, and so good to see Meg so lively. 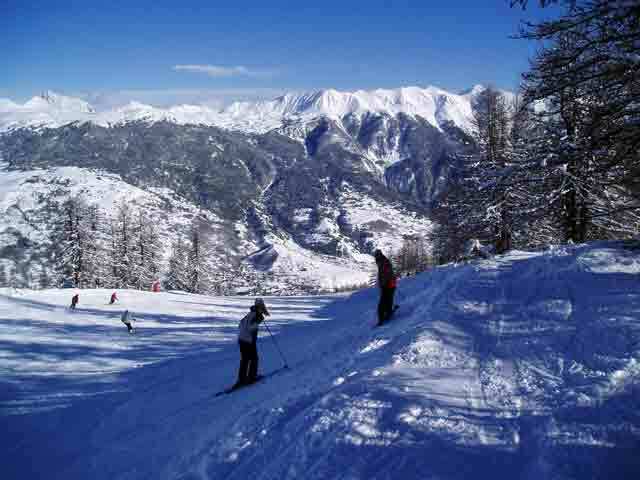 A family ski pass for 2 adults and 2 children aged up to 21 is available in Serre Chevalier this winter. Prices online now http://www.serre-chevalier.com/en/winter/ski-area/skipass/family-pack/ . Ask us about ski passes and we can arrange to have them ready in the apartment when you arrive. How do you know you are safe to book with us? With many stories in the news over the summer about unsuspecting holidaymakers turning up to find accommodation does not exist, or that the owner doesn’t expect them, how can you be certain that we are genuine owners and that your holiday is assured? Take your time to contact us before hitting that book now button if you have any doubts . Have a look around the internet for reviews (we have some on both Home Away and Trip Advisor). Use Google to check for images of the apartment. We have operated Chalet Chamoissiere for 8 years now, and advertise on several different holiday rental listing sites, including French sites, and have had our own website from day 1. We offer a secure payment method for your deposit and balance, and a personal service in resort from our management team at Eurekaski who we have worked with since 2006. Find us on our website at http://www.chamoissiere.co.uk for prices with no booking fees. Have a look at our online Insider Guide to Serre Chevalier for any information you may require on skiing, summer in Serre Che, and things to do when you aren’t on the slopes. Have a look at it to find out more information on the area and what there is to do. It is so much more than just a ski resort. Pass Partout, your passport to activities in the valley. 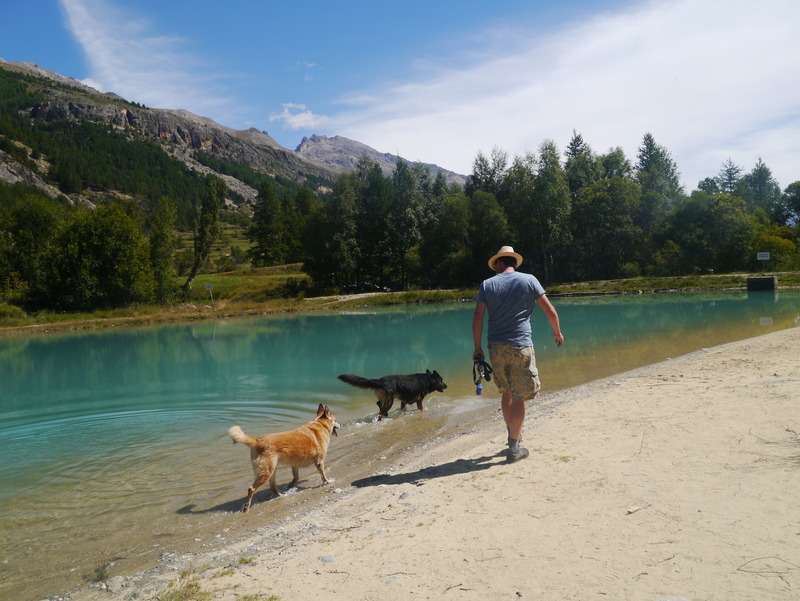 Purchase a Pass Partout for a discount on all your activities in Serre Chevalier this summer.